Old Red Museum of Dallas County History & Culture tells the story of Dallas, Texas through family friendly exhibits in historic Dealey Plaza. 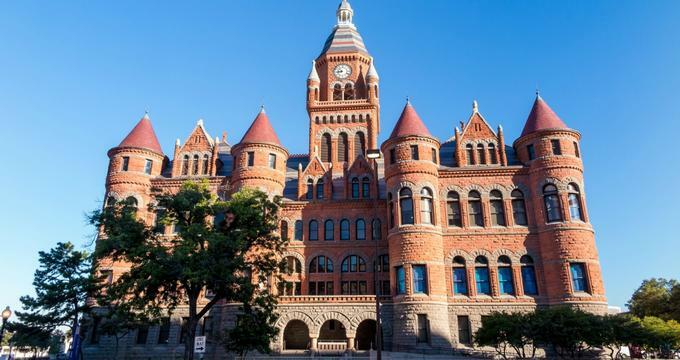 The Old Red Museum was constructed in 1892 as the Dallas County Courthouse. The building was constructed to be fireproof, made from steel and stone. The building has been fully restored and is open from 9am to 5pm daily. Admission fees can be found on the Old Red Museum website. There is no parking at the Museum; however, there is an underground parking garage available near the southwest corner of the museum. The museum features exhibit that articulate the economic, political and social history and culture of Dallas County. The bell and clocktower that are a part of the Tower are replications of the 19th century tower that was removed in 1919. There are 4 terra cotta Wyverns or, serpent figures, that sit atop the museum. Two of these are original to the museum while the other two were reconstructed in the restoration process in the 2000’s. Both the Grand Staircase and Hatton W Sumners Restored Courtroom have been restored to their 1892 appearance. A vault was also discovered during the restoration process, hidden away behind a bookcase that was used by the Dallas County Treasurer. The second floor of the Old Red Museum is dedicated to telling the history of Dallas County through the early years of prehistory through modern day. Early Years Gallery: Prehistory-1873- The first Dallas settlement was in 1841 but this exhibit will go further back than that. Visitors will discover mammoth remains, fossils, Civil War weaponry, and many other artifacts from the early years in Dallas history. Trading Center Gallery: 1874-1917- The economic explosion in Dallas County is studied in this exhibit that details the arrival of the railroad, the boom of the trade industry, wholesale, and aviation, and the State Fair of Texas. Big “D” Gallery: 1918-1945- Dallas became very popular between WWI and WWII due to the Texas Centennial Exposition and earned the nickname Big D. Visitors to this exhibit will learn the history behind this name and about the blues musicians from Texas, and the significance of the Centennial. World Crossroads Gallery: 1946-2007- Dallas after war and how they recovered post tragedy is explored throughout this exhibit that follows the country from the end of World War II into the 21st century and features memorabilia from prominent sport figures, films, and television shows. Special exhibits are given space on the first floor of Old Red Museum and are curated by the museum for temporary seasons and from items in the museum collection that are not included in the permanent exhibits. Current and upcoming exhibits are detailed on Old Red Museum website. The Old Red Museum is dedicated to preserving the history and culture of Dallas County and provides many resources for educators and youth programs. Touring the Museum- School groups receive discounted admission for group trips planned in advanced. Thousands of students in grades K-12 tour Old Red Museum annually. Students are provided with a Gallery Guide to help with interactive experiences in the four galleries. Discovery Carts- These carts are available for students to use to explore exhibits in Old Red Museum more thoroughly and engage deeper into the history of Dallas County. These are used in conjunction with educator curriculum. Children’s Education Center- This space is designed for children to have hands on experiences in history and use TEKS based computer programs to explore Dallas County history. Any student groups in grades K-12 are welcome to use the education center. Youth Programs- Old Red Museum offers many youth programs including summer camps, holiday programs, and scout programs. Reservations for these programs are required with groups of at least 15 needed for each program. History Conference- this annual program ticketed program for adults is a conference that discusses politics, democracy and history topics with lunch provided and prominent guest speakers. Educators can earn CPE credits by attending. History Labs- These in-depth labs focus on specific themes in Dallas County history and students engage in hands on interactive ways to put their knowledge and skills to the test. Labs relate to the justice system, music exploration, the courthouse, traveling by train, pioneering, computers, leadership and democracy, and architecture, and even how to survive a zombie apocalypse in Dallas. Old Red Museum can be rented for public and private events such as birthday parties, weddings, business functions and fundraising events. The Great Hall is the largest space accommodating up to 400 standing guests. There are also private suites available on the 4th floor for bridal parties.